Im not sure where to start but i will give it a go. I met Andy around 2008 and from word go he was full on texting, calling, visiting.. and from a naieve woman i was i believed every word he told me. He told me he was a commercial lawyer working for channel 7 and also working as an under cover police officer. He was huge at dropping names and also promised to get tickets to the filming of shows on the mainland due to his contacts…funnily enough i never saw them. He would splash cash around, buy gifts etc. Back then i fell for this man, believed everything he said…the work trips away, the lack of communication as he was in meetings all the time. Id introduced him to my friends…one friend in particular saw straight through his lies…she called channel 7 and tried to track him down…and of course there was no andy tchappat that worked there. I confronted him and he blew it off saying she must have called the wrong department or something like that. Due to andys increasing non communication and my friends nagging doubts… i left him… i would get texts and phone calls saying how he loved me how we were meant to be together…how we needed to have total honest and open communication for a realtionship to work. And of course that didnt happen so i went my own way. It wasnt until a few years later i ran into him…and the messages started again. 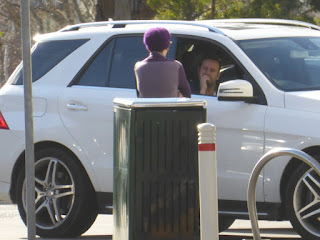 He still loved me..we should be together blah blah… we did catch up for coffee and he told me he was part owner of a brothel in sydney and was making over $80 000 a year in just that.. he also said one of his tasmanian friends was over there running it for him. He also said he was regional manager for a lightning company and travelled a lot for work…and he said i should travel with him as his new girlfriend! I was already wary of him…i knew he’d lied in the past…so didnt jump to any conclusions. He also told me that his dad died a few years ago in a car accident. I didnt doubt him..but never checked up on it either. This last time we so called reconnected we were supposed to meet up for dinner etc…but when i text after a few days of no contact he texts back saying he had been busy on the mainland with meetings for his company. After reading other womens stories…the constant stream of similar lies… this man will only continue to hurt those around him. I applaud his ex wife for speaking up and i fully support her for solely raising her sons. I had no idea the depth and extent of his lies and deception. All i can say is share this and get word out.